Here it is at last, the musical equivalent of a 1001 Centigrade enema, the debut of the legendary Happy Family. This one is not for the saccharine-fluffy prog types, this is like Slayer covering Univers Zero tracks — like Paga overdosing on amphetamines. You get it — this is heavy, rapidly paced, balls first and unequivocally brilliant. I'll skip the details, you can read all about them in last issue's article by Dan Casey, but suffice it to say that this is technically outrageous, nearly suffocating in intensity, and very original in its execution (regardless of all the zeuhl / UZ tendencies). Certainly my vote for one of the best of the year, Happy Family have delivered on all the hype! 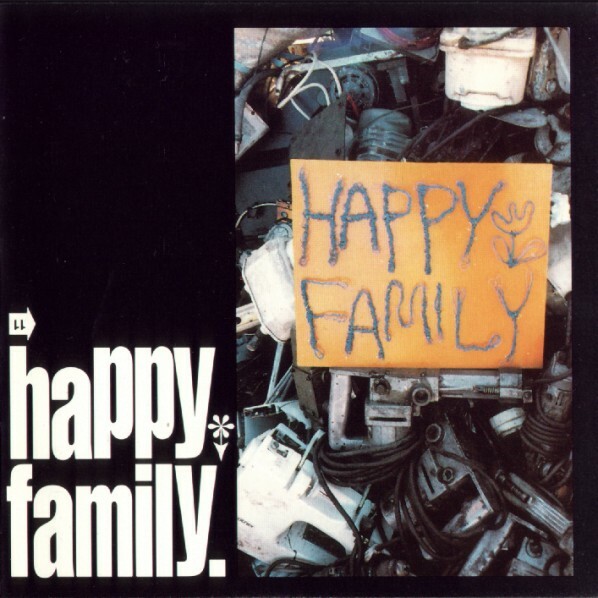 Happy Family recently created a stir in the prog world without ever releasing an album. They are one of those rare few who received a great deal of hype, not by record dealers, but rather by fans. At last their debut album has arrived, so those who have not heard any of their live bootlegs (a good many) can now find out what the big deal is. Happy Family fit in well into the Cuneiform style. Their complex music rather resembles an exclusively rock version of Univers Zero, with touches of middle-period King Crimson intensity, flashes of Area and Henry Cow dissonance, and hypnotic rhythms anchored by powerful bass-lines a la Magma. The basic musical construction is of a repeating pattern gradually building in intensity. While some may find this technique tediously repetitious (a problem many find with Magma as well), it also shows the raw power of the ensemble. The guitar / synths / bass / drums line-up fuses brilliantly, notably on the feature length "Naked King" with its constant build-ups of tension. In fact, the pace does not relent until the final track, the pensive (if somewhat disturbing with its bat-squeak sounds) "Drums Whisper Spacy." The music at its core is fiery rock, with occasional deviations from the norm as on the jazzy "Rolling the Law Court" which sports an arrangement for multiple saxophones. I am pleased to say this album was worth the wait. I'll trust the opinion of my fellow prog-heads over record dealers' hype any day. So since it is the fans that put Happy Family on the map, shouldn’t that tell you something? The long awaited debut CD by this Japanese four-piece is finally here, and indeed it was well worth the wait. It delivers on all the promises that might be expected after hearing the various live tapes that have circulated in the last few years. For a comprehensive history of the band, I would refer the reader to Dan Casey's outstanding artist profile in our last issue. Happy Family has their sound, culled from the extremes of a rock base and fused with irrepressible energy. From the opening track one will immediately hear the influence of Magma in the playing of bassist Tatsuya Miyano. He actually could be Jannick Top! Yet the Magma influence seems to go no little further than the bass, and for the rest of their sound comparative descriptions must be qualified. The compositions are angular, dark and twisted, with a bit of a chamber feel under the powerful rock surface and lightning speed; kind of like Univers Zero with guitars on amphetamines. Some influence from Crimson abounds too — and not just in their name, especially evident in some of the protracted excursions like "Naked King," "Partei," and "Kaiten." Even some Canterbury elements are here in mild doses, hiding inside tracks like "Rolling the Law Court," where keyboardist Kenichi Morimoto uses some very convincing sax samples (I still swear it's the real thing, but the band's manager has told me otherwise). Throughout, Happy Family has maintained that fresh spark of forward looking originality that points to the future of progressive rock. Five of five stars, this one deserves your attention.